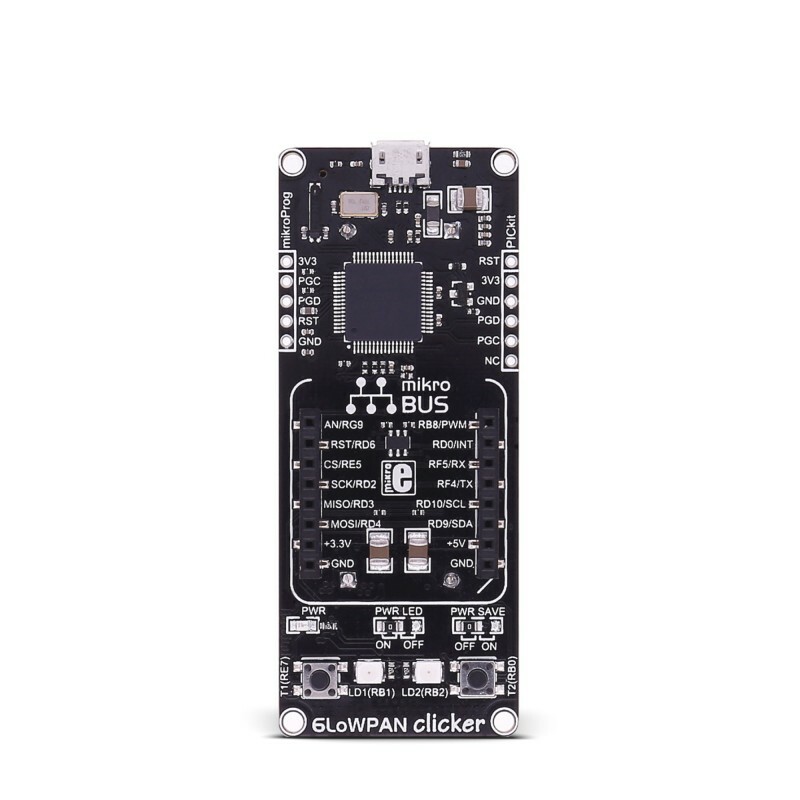 6LoWPAN clicker is a compact development board with a mikroBUS™ socket for click board connectivity. It carries Microchip’s PIC32MX470F512H - 120 MHz/150 DMIPS, MIPS32® M4K® core microcontroller. And CA-8210 2.4GHz ISM band transceiver, which allows you to add wireless communication to your project. 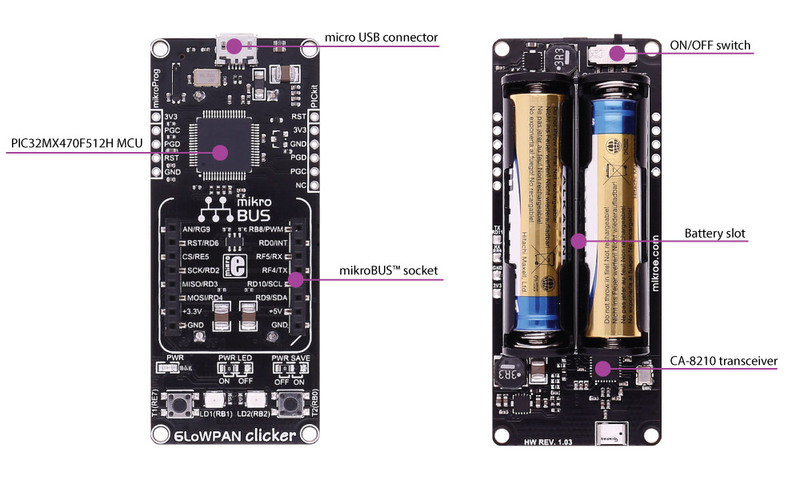 Hundreds of possibilities with click boards.Take advantage of the constantly expanding range of over 300 click boards™ - the onboard mikroBUS™ socket allows you to add new functionality to your project. Each click boards™ comes with a set of working example code. Programming.To make your prototyping experience as convenient as possible, MSP432 clicker is preprogrammed with a UART bootloader. Just download our mikroBootloader application and you’re ready to upload your firmware. On-board mikroProg for MSP432 connector enables programming through external programmer/debugger. 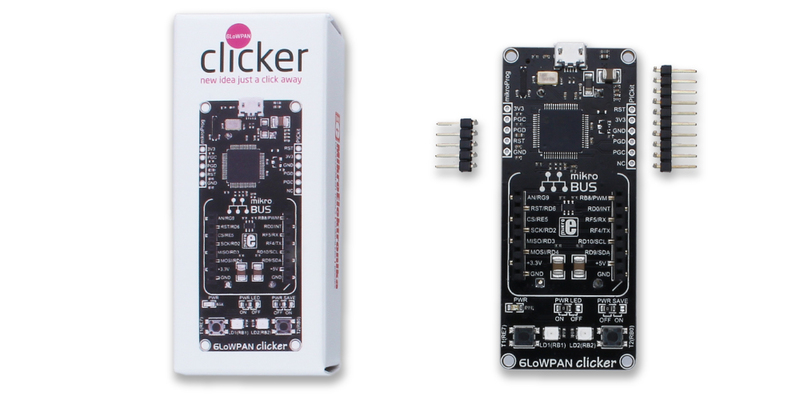 6LoWPAN clicker has a PICkit™ connector on the right side of the board, for Microchip’s Debugger/Programmer. CA-8210 transceiver features The CA-8210 is a fully featured transceiver modem solution for IEEE 802.15.4 communications in the 2.4GHz ISM band. The device is based on a revolutionary radio architecture, which delivers improved receive performance for no penalty in power consumption. PIC32MX470F512H microcontroller featuresThe 6LowPAN click comes with the PIC32MX470F512H microcontroller. This 32-bit MIPS M4K core high-performance microcontroller is rich with on-chip peripherals and features 512 KB of Flash memory and 128 KB of RAM. Everything you need to get started.This compact development board brings the flexibility of click boards to your favorite microcontroller, making it a perfect starter kit for implementing your ideas. mikroBUS™ is specially designed pinout standard with SPI, I2C, Analog, UART, Interrupt, PWM, Reset and Power supply pins. See Standard Specification. 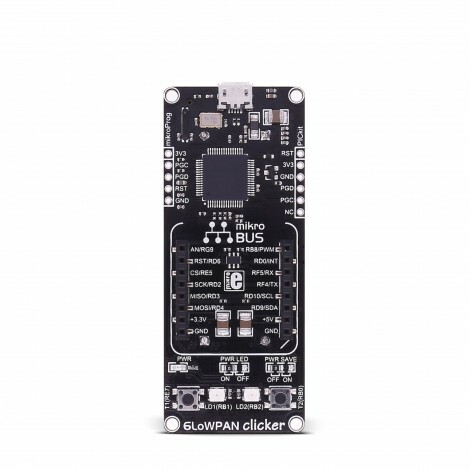 Applications This compact development board brings the flexibility of click boards to your favorite microcontroller, making it a perfect starter kit for implementing your ideas.